Rarely does a novel come along that combines juicy gossip, jealousy, revenge, cheating, and even telepathy, with a delicious recipe for fun. In her quest to tell a satisfying story with a diversion – comfort food for the mind – Kim Moritsugu has indeed succeeded. As Mary Ann is lounging around the pool of the Oakdale Country club on the last day of summer, reminiscing of a life she was fated to and a body she wished she had, she makes a decision that will change her life. Well two decisions really. One, that she’s going to start a dinner club, and two, she’s going to have an affair (perfectly “acceptable” since her own husband cheated on her). Actually, the idea is really to kill two birds with the same stone. The invitees to the dinner club include three men she has earmarked as potential lovers, her best friend Alice, her mom, and a couple of other random members that she identified as foodies who could cook. 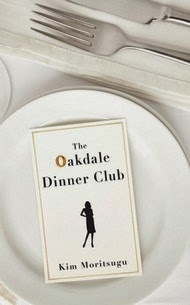 With a few hiccups getting it started, when Mary Ann realizes that her plan may not go exactly as planned, the Oakdale Dinner Club eventually gets to a comfort level where new friendships develop over food and wine. The attendees find solace in the events and even discover an outlet to explore their own relationships and bliss in their lives and careers. This is a Desperate Housewives meets Mistresses kind of book, sprinkled with a delicious helping of foodie. If you are looking for a book that’ll deeply touch you and change your view of the world, this is not it. Instead if you are looking for a light read at the beach or doctor’s office, one that will delight you in the frivolous adventures of “the real housewives of the suburbs” this book may just engage you enough to make the most of your time. Two literary references Kim Moritsugu felt that influenced her in the writing of The Oakdale Dinner Club were Maeve Binchy’s novel Evening Class, with its skillful interwoven storylines, and John Wyndham’s The Chrysalids, with its memorable depiction of telepathic communication. What is the one novel that everyone should read?